I’ve realized that Nethack is indeed amazing, and a shitload more vast and complex than World of Warcraft. I’ve also realized its too much for me. 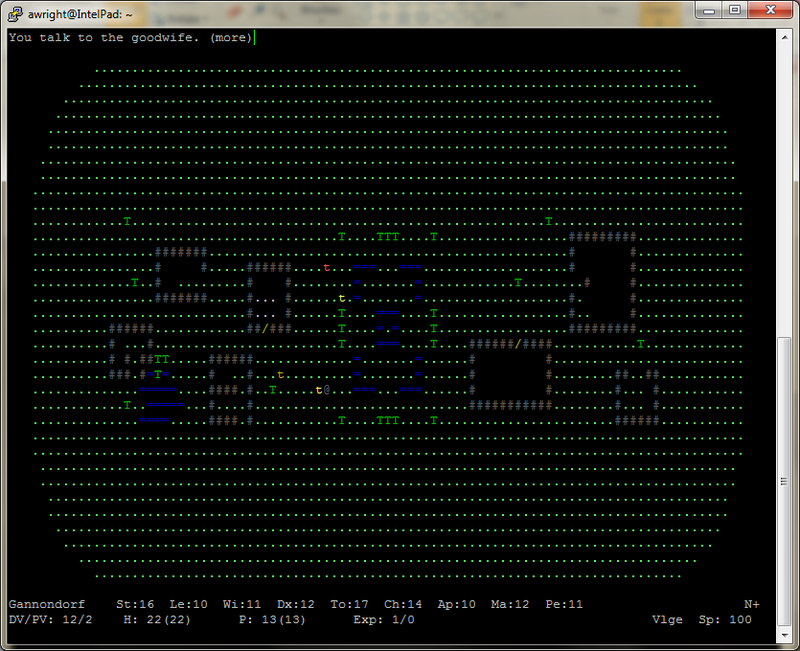 Instead, I’ve started playing ADOM (Ancient Domains of Mystery), which uses the same 2-D roguelike engine that Nethack uses, but is more like a simple RPG game. You still have the dungeons and monsters, but you also have the main world map to move around on and explore. 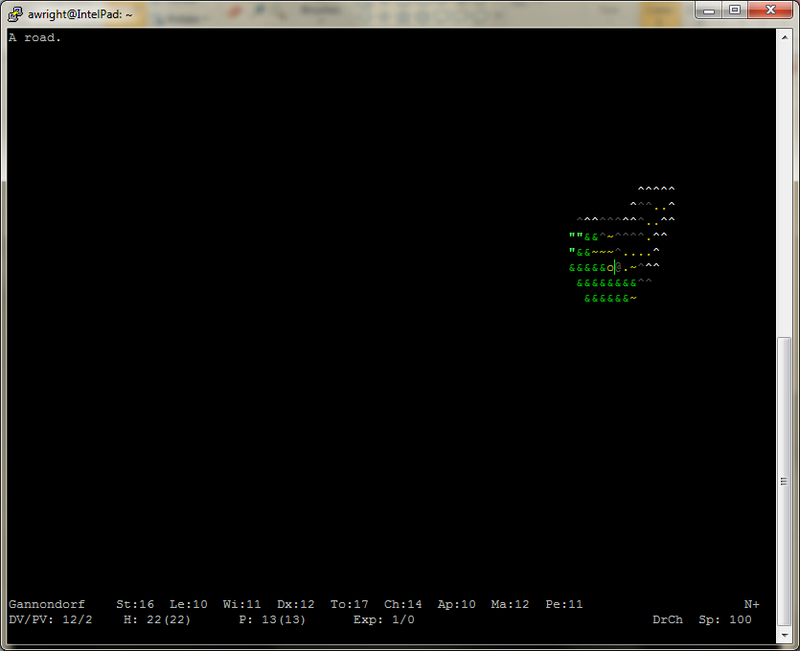 Its like if someone remade an old Final Fantasy or Dragon Warrior or Ultima with ASCII characters, so that you can play it in an SSH session! 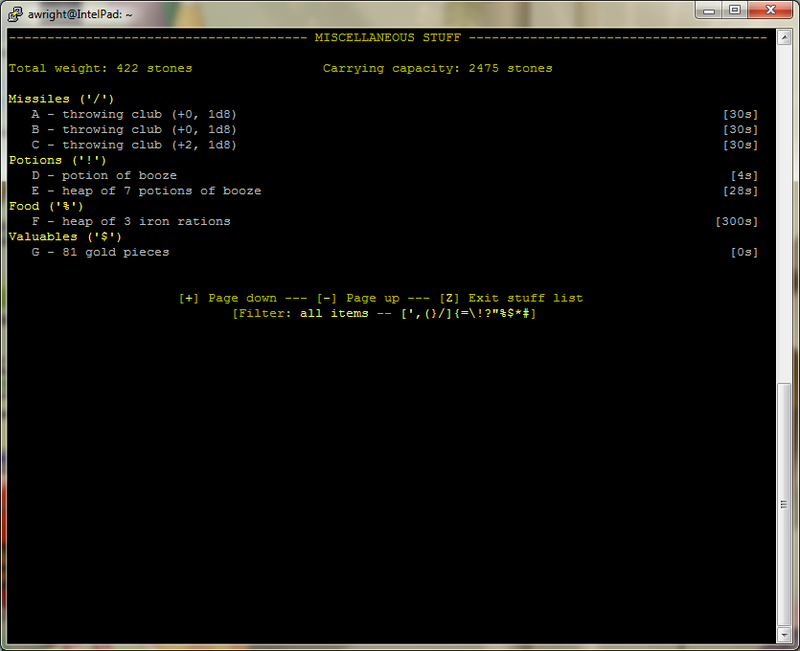 Unlike Nethack, ADOM features nice tutorial screens, letting you know what to do next if you’re new to the game. 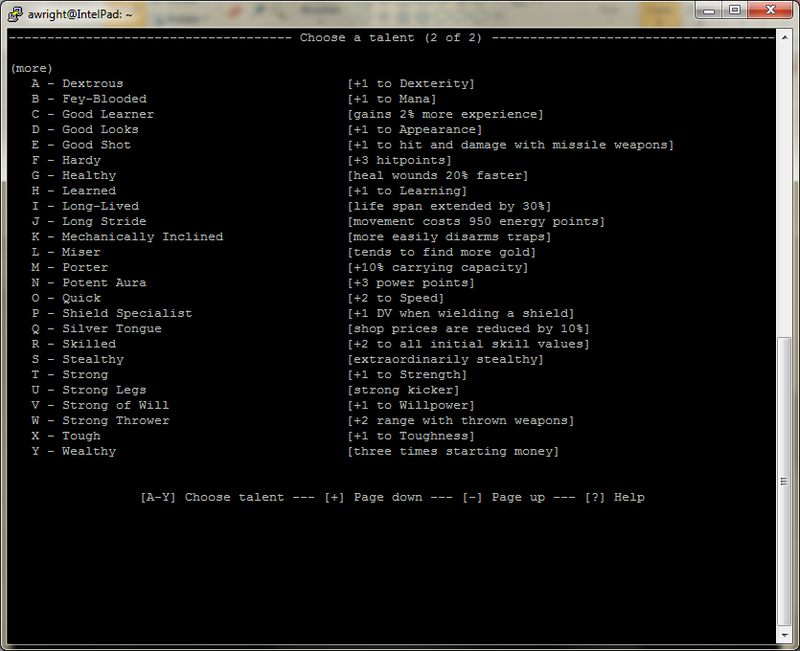 Quests and a quest log are also a part of the game, unlike Nethack, as well as many more free-moving NPCs which help the player along his or her way. Probably even more noticeable to new players is the change of button scheme allowing for much easier control of character actions For instance rather than typing “#chat” to talk to an NPC, you press Shift+c, and when you press “e” to eat something when you’re hungry, you’re given a nice menu of all edible items in your inventory. The player’s inventory has also been remodeled to actually show what each slot (right hand, left hand, head, legs, etc) on the player contains, even if they’re empty. 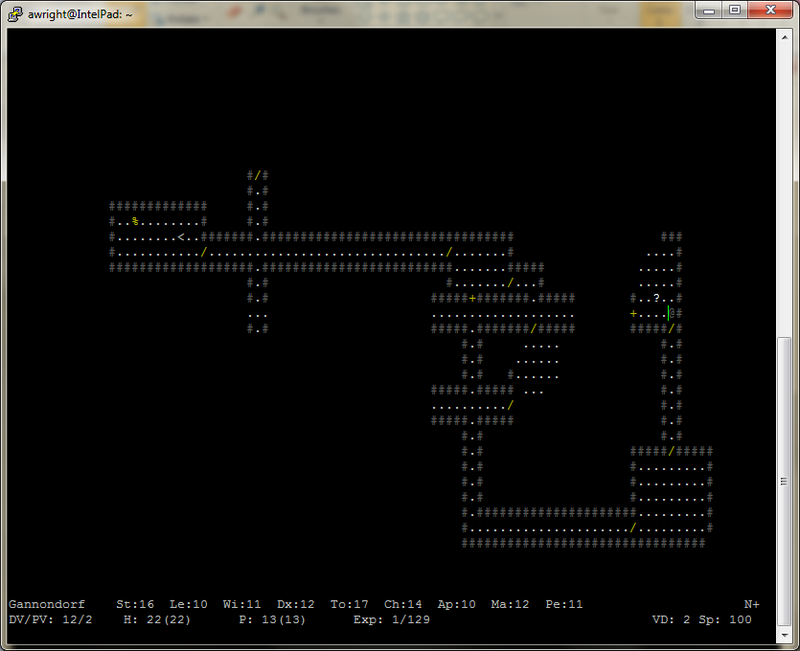 In my geeky opinion, there are tons of features in ADOM that make it more fun and easier to play, which make it more addicting than Nethack. 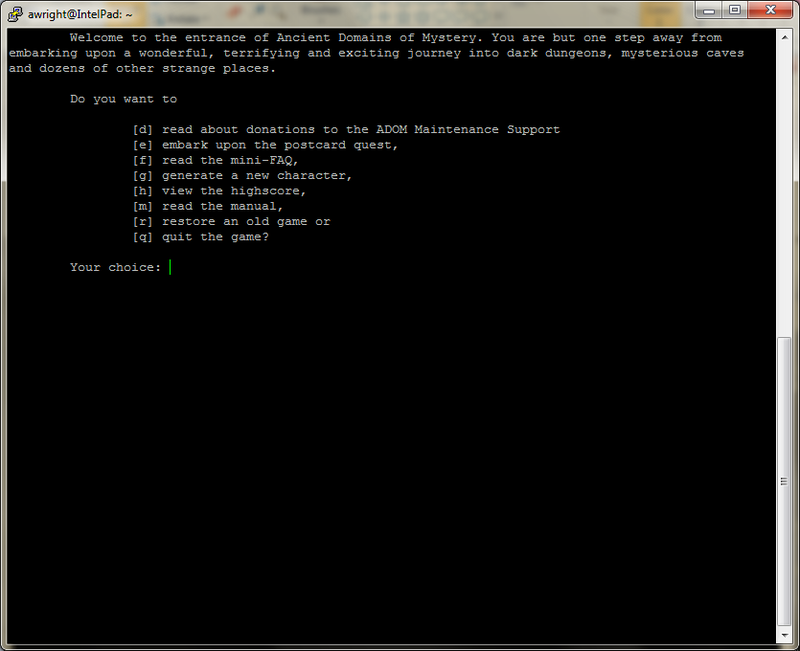 However, while in IRC chat with some experienced Nethack players, they did attest that they’ve gotten so into Nethack that ADOM seems petty and almost childish now. 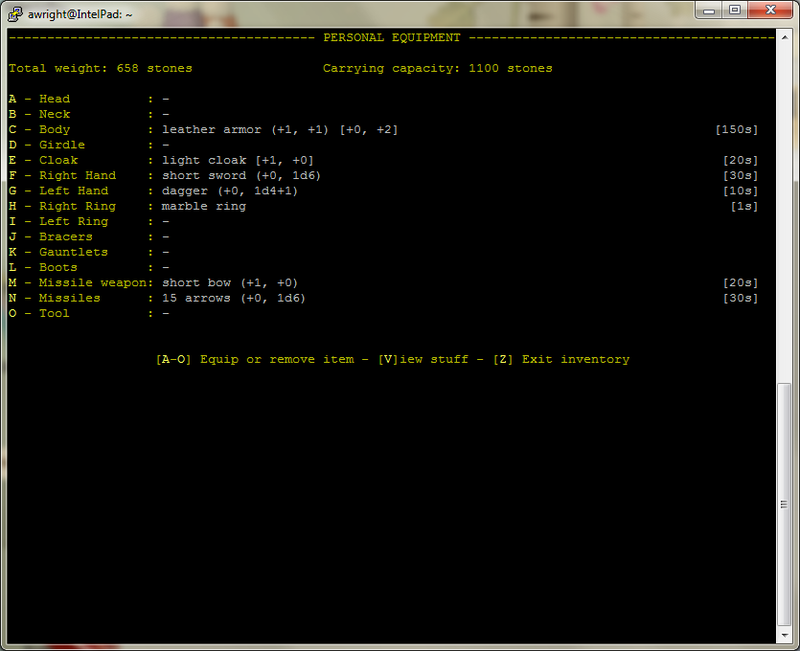 But, being a newb to text-based games, I’m not complaining. 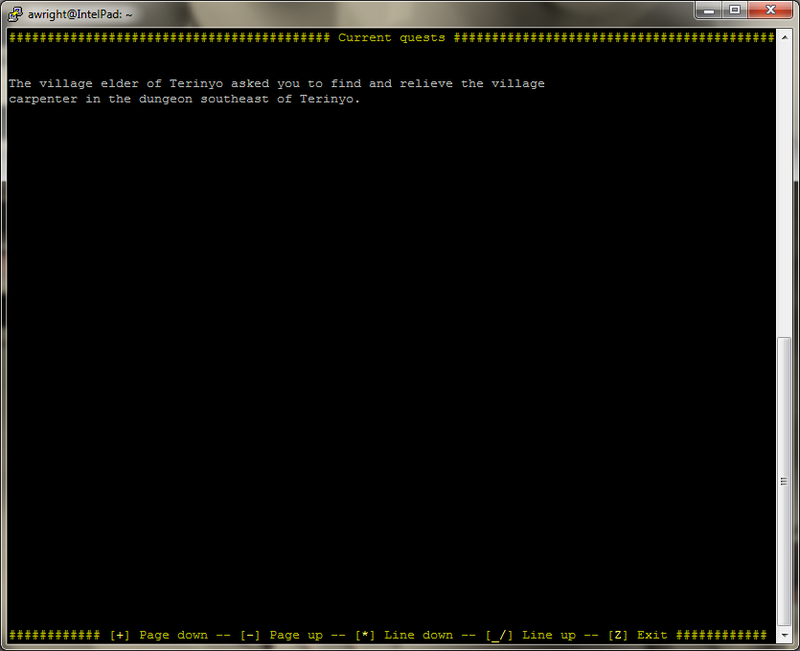 Installing the game is pretty easy; the officail ADOM.de site offers a tar archive which contains a simple executable that you just run from command line, but you should probably keep the executable in “/usr/games”. The ADOM.de site also says to create a new user and group named “adomown”, this is unecessary (or at least it was unnecessary for me). Put any questions in the comments.